Discover more about Earnside Energy, food waste policy and the Circular Economy. Earnside Energy operates one of the United Kingdom’s most efficient Anaerobic Digestion plants. With over a decade’s experience of In-Vessel composting and over six years of experience of Anaerobic Digestion, we have a highly experienced management and operations team. With the backing of long-term investment, we significantly increased our food capacity in 2017. The site now has the capacity to process over 80,000t of waste per annum. Earnside Energy is managed by the team at Powerhouse Management Limited and backed by Albion Capital Group LLP. The operational team has been managing the plant since commissioning, one of the reasons we’re able to achieve high levels of operational efficiency. Find out more about the policies that are driving reductions in food waste, the circular economy and UK food waste statistics. Earnside Energy is a member of the Anaerobic Digestion and Bioresources Association. The organisation was established in 2006 with the primary objective of representing the interests of the Anaerobic Digestion and Bioresources industry. The association aims to ultimately reduce and remove some of the barriers facing the industry, to allow their members to grow in their respective sectors. More information regarding their work can be found here. In 2016 the British Retail Consortium published an extensive report, analysing the retail industries contribution to reducing their annual percentage of food going to waste. Food waste from businesses across Scotland is transformed into renewable energy and digestate. The green energy is used to power these businesses through PPA agreements and other mechanisms. The liquid digestate is used to grow crops which then, in turn, become food. So waste food helps power food production businesses, and helps farmers to grow more food. Waste food is, therefore, a valuable circular resource and not a waste in the traditional sense. More information regarding the Circular Economy can be found here. This is an ambitious voluntary agreement coordinated by the registered sustainability charity WRAP. The signatories of this agreement commit to try and reduce their food waste volumes by 20% by 2025. The UK’s major supermarkets and many hospitality businesses have already signed up to Courtauld 2025 agreement. Th plan sets out three key actions it would like to achieve including: An increase in food waste that is regularly collected and a collective sharing of the benefits and drawbacks of recycling. In addition, the action plan would like to improve the provision of dependable, long term food-waste, to the Anaerobic Digestion and In-Vessel composting sectors. Full information regarding the plan can be found here. It is startling to know that it takes almost 30% of the worlds agricultural land to grow food that is ultimately wasted! With the global population increasing inexorably we all have a responsibility to waste less food. It is no surprise then that there are many policies at a national, EU and global level that address this and related issues. This web page details a series of estimations regarding food surplus and waste arising within the United Kingdom each year. Key details from this includes information from the three major studies published in 2013 and 2016 by the sustainability charity WRAP. Their key findings concluded that UK households, hospitality, foodservice, food manufacturers, retail and wholesalers annual food-waste stands at around 10 million tonnes, 60% of which could have been ultimately avoided. More information regarding this report can be found here. Love Food Hate Waste is a charity with the primary objective of raising the profile of the importance of reducing our food waste, and the everyday things that we can do to ultimately reduce what we put to waste in our own homes. In the United Kingdom, the Government has a target of 50% of all household waste being recycled by 2020. This is an EU initiative that will continue to be relevant post-Brexit. In 2017 the recycling rate in England declined for the first time to 44%, with only 45% of local authorities across the UK offering separate food waste collections. In Wales, Scotland and Northern Ireland food waste must be collected separately and treated through Anaerobic Digestion plants. Although this isn’t the case yet in England it is expected that this will happen in the near future. When it does, anyone producing waste food will be obliged to segregate it away from other waste streams. A failure to abide by this law may result in fines, such as in Scotland where penalties of up to £10,000 can be enforced if you fail to separate your household waste. This is a UN directive regarding 17 sustainable development goals which were published in 2016. Goal 12.3 essentially relates to cutting waste food by 50% by 2030 across the globe. There are many Champions of goal 12.3 including multinational firms such as Tesco, Unilever and Nestle. More information regarding the 17 sustainable goals can be found here. In 2016 the Renewable Energy Association published a report titled “The Real Economic Benefit of Separate Biowaste Collections”. The key findings and full report can be found in here. 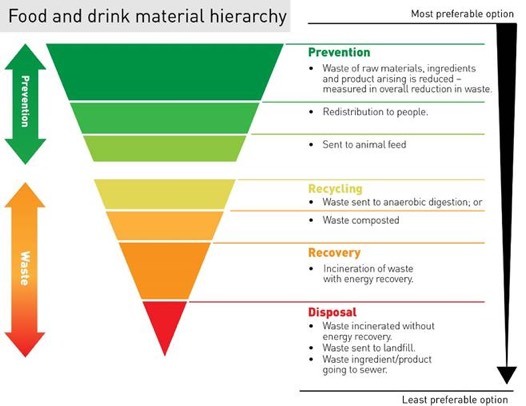 The EU Waste Framework Directive adopts the idea of a waste hierarchy. It has now been included in British law which means that where reasonably practicable, waste must be managed as high as possible up this hierarchy, as demonstrated in the picture. For food waste this once again means taking the waste food we collect to anaerobic digestion plants ahead of other options. In this instance it is the food waste producers responsibility to ensure that the waste hierarchy is followed, and this is reflected in the duty of care waste transfer note, that accompanies all waste collections, from businesses around the United Kingdom. Wrap is a British registered charity that works with a range of different partners across government, business, communities and individuals. Their primary aim is to deliver a range of plans and initiatives to ensure that society becomes that bit more sustainable. Funded by the Scottish Government, Zero Waste Scotland primarily exists to ensure that we create a society where our natural resources are valued for what they are, and to encourage us to make a more concerned effort to ensure nothing is unnecessarily put to waste. The primary goal of the corporation is “To help Scotland reap the environmental, economic and social benefits of making the best use of the world’s limited natural resources”. Full information regarding Zero Waste Scotland and the work they undertake can be found here.